According to health experts, your body gets its energy from the sun. We’re not saying you go out and expose yourself under the sun all throughout the day to be fully energetic. Though your body benefits greatly from direct but gentle sunlight, spending too much time under the sun is totally harmful. So, how to get maximum energy from the sun? The answer is simple; by eating foods that gather its energy from the sun. These foods store the sun’s energy in them and transfer that energy to your body once you eat them. These veggies are immature soybeans that are loaded with protein and phytoestrogens that can give you higher energy. You can simply add them to your vegetable recipe or have them as salads. They’re easy to prepare. Just boil them and sprinkle with sea salt. These veggies are also popular in Asian restaurants and cuisines. When dining out, look for a place where these foods are available. B vitamins are called energy vitamins because they’re the best fuel for your body to keep yourself energized. Fatty fish such as salmon, sardines, and tuna are also the best sources for protein and fatty acids that work against inflammation, which can make you tired. Vitamin B12 and folic acid in fatty fish help produce red blood cells and help iron to function better. With these two substances performing at its best, you’re more energized and are less prone to fatigue. 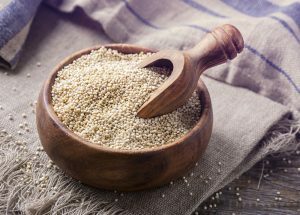 Quinoa is another energy-boosting food. It’s rich in magnesium and protein that can relax your blood vessels and muscles and provide you with the energy that could last throughout the day. Brown rice is packed with fiber, vitamins, and minerals that the processed white rice contains less of. Brown rice is also rich with manganese, which is responsible for the breakdown of carbohydrates and protein to create energy. The fiber content in brown rice has a low glycemic index; this means you don’t have to worry about your blood sugar levels while keeping your energy levels at par. If you’re looking for more energy and stamina to make you last in your workout sessions or even in bed, you should try beets. Beets are rich in antioxidants and nitrates that can help to regulate proper blood flow. With more oxygen flowing smoothly throughout your body and tissues, you’ll have more energy to perform any tasks at hand. Blueberries are popular for their antioxidants that can help fight cancer and delay aging. On top of this benefit, blueberries are also loaded with fibers that enable the slow delivery of energy. This means you’ll still stay energetic even when you’ve consumed blueberries a few hours earlier. Blueberries can be a nutritious addition to your smoothies or oatmeal. Leafy green vegetables that are packed with nutrients and energy-boosting properties include spinach and kale. The iron, calcium, magnesium, potassium, and vitamins A, C, and K in these leafy greens help boost your energy while the folic acid and fiber that they contain are antioxidants that help fight certain diseases. Iron is popular for warding off fatigue, which is the most common symptom of iron deficiency. Vitamin C helps in the absorption of iron in your body. When you have an adequate supply of iron in the body, your red blood cells can work well in delivering oxygen throughout your system. An inadequate supply of oxygen can result to fatigue. Additionally, leafy greens are a good source of nitric oxide, which is responsible for widening the blood vessels for proper blood flow. Add leafy greens to your salads for a healthy meal or snack. Tossing them in your smoothie in the morning can help maximize your energy levels throughout the day. These nutritious root crops are rich with carbohydrates, beta carotene, and vitamin C that help keep fatigue at bay. Your kids will surely love mashed sweet potatoes. 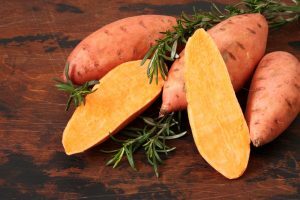 Sweet potatoes are also a healthy alternative to french fries. Just cut them in strips and deep fry in oil. If you have sweet potatoes in your garden, you may want to add the top leaves, which are rich in iron, to your smoothies. Nuts such as almond and cashews are not only great for snacks but also for providing you the energy you need to tackle your daily tasks. These nuts are rich in calories, proteins, carbohydrates, and healthy fats that allow for a slow release of energy in your body. Nuts also contain omega-3 fatty acids that are known for its abilities to fight inflammation and antioxidants that fight against cancer. Other nutrients found in nuts include B vitamins, vitamin E, iron, and manganese that reduce the feelings of fatigue and tiredness while increasing your energy levels. Apples are exceptionally beneficial fruits. Aside from helping you maintain overall health, they also help boost your energy levels. Because apples are rich in fiber, they take longer to digest and make you feel full a bit longer. Apples can also make for a healthy snack. Beans contain carbohydrates, fiber, and protein that provide you with natural energy. Like other fruits and veggies, beans also take time to digest, which is effective in maintaining your blood sugar levels while keeping you energized a bit longer. The most nutritious beans are black beans and black-eyed peas. They are a rich source of energy-producing nutrients like manganese, magnesium, folic acid, and iron. Last but not least, bananas. When it comes to energy boosting foods, banana is always included in the list. Bananas are the best friends of athletes and health enthusiasts because of their fiber, potassium, and natural sugar content.